How do you define a warrior? 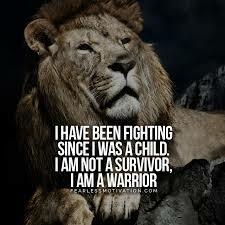 If I were to ask you how you would describe the warrior in you, what would you tell me? On the wheel of astrology Aries is ruled by Mars the God of War. In astrology Mars is the planet of energy, action and desire. It is the survival instinct, the animal nature of man, Mars rules our assertiveness, the driving force behind many of our actions and our passions. The sign of Mars is our determination, our anger and our will to survive, we all have Aries in our birth chart somewhere, so in fact somewhere hidden in you there is a fierce and mighty Warrior. My Sun is in the sign of Aries and so the Warrior in me comes as natural as the sun rises and sets each and every day. The Sun represents our personality and so for any of you, that know my journey I’m sure you can attest to the Warrior in me. My passionate desire in this life experience is to teach you about the Warrior in yourself. You may ask, ‘how do I connect to the part of me that I do not know’? Just like anything else we are unaware of or unenlightened about it is our work to become schooled in the subject. It is our duty and our karma to sophisticate our self where we lack knowledge so we may strengthen our Soul. Ignorance is nothing more than unconsciousness if your naivety is robbing you of your birthright to be happy and peaceful then release the innocence of your Self which must become the Warrior. Is it your time now to become a soldier of service, has the time come for you to make some changes in your life, in order to be of service you must first take care of yourself. A Warrior is a person who shows great vigour, courage and assertiveness, these traits do not always come easy to the layman, but this does not mean you are void of such worthiness. Ashia is an Arabic name meaning ‘life and hope’, perhaps this is the name you can acquire for yourself, a middle name to grant you the courage you need to become the mighty Warrior you are meant to be.